Learn 10 pregnancy nutrition tips that are essential for a healthy pregnancy! Nutrition during pregnancy is extremely important for the development of your growing baby and to help you feel your best. 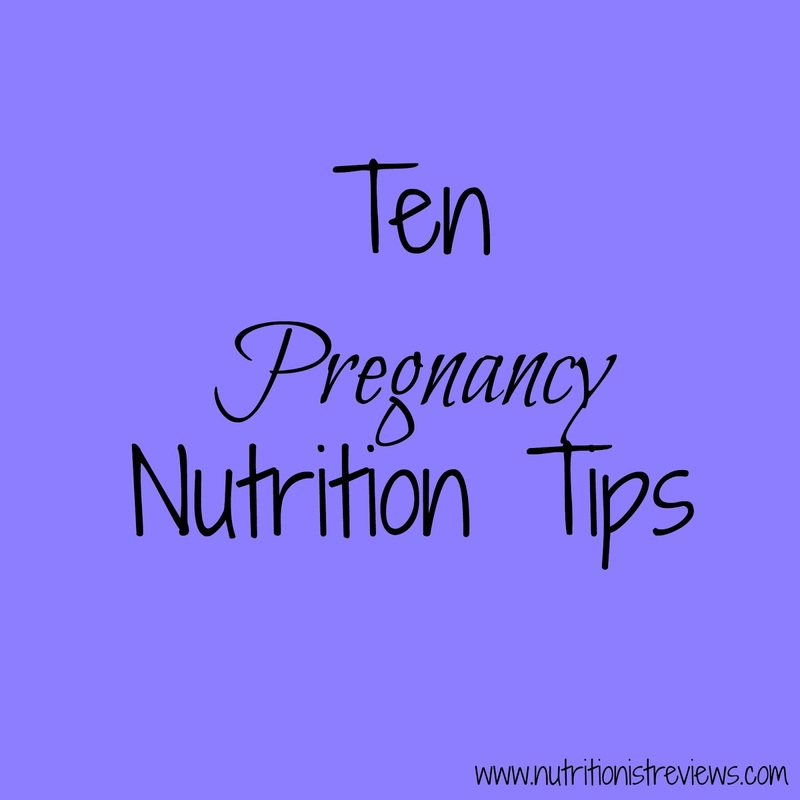 These 10 tips will help you understand which nutrients that you need during pregnancy and why. When I was pregnant with Adalyn, aside from the couple weeks of nausea, I tried to eat really well. Strangely, I was not loving the vegetables like I normally do. Luckily, I was able to eat most foods and provide the nutrition that Adalyn needed. 1. Load up on fiber- Constipation is a common side effect during pregnancy and consuming enough fiber can help to counteract this symptom. Aim for at least 25 grams per day. Focus on high fiber foods such as fruits and vegetables, whole grains, beans and nuts. 2. Consume omega-3 fatty acids- Omega-3 is found in many kinds of fish and is important for your baby's brain development. Aim for 8-12 ounces of fish per week during your pregnancy. Low-mercury choices that are safe for pregnant women include shrimp, salmon, pollock and catfish. 3. Focus on a balanced diet- A balanced diet ensures that you get all of the nutrients that your body needs during pregnancy. Focus on eating a variety of fruits and vegetables, whole grains, low-fat dairy products and lean meats. 4. Avoid these foods- Some foods are recommended to avoid during pregnancy including: seafood high in mercury including swordfish, shark, king mackerel and tilefish. Avoid undercooked meat, seafood and eggs due to being at an increased risk for foodborne illnesses. Also, unpasteurized foods should be skipped including soft cheeses such as feta, blue cheese and Brie along with unpasteurized juices. 5. Eat protein rich foods- The recommended amount of protein to consume during pregnancy is 75-100 grams per day. Protein rich foods help the growth of fetal tissue including the brain, increases blood supply and helps breast and uterine tissue grow. Focus on nutrient rich protein sources such as Greek yogurt, milk, lean meat, beans and nuts. 6. Take your prenatal vitamin- Your doctor can recommend a prenatal vitamin for you to take daily. This is important in addition to a healthy diet to help you meet all of your nutrient needs for you and baby during pregnancy. Especially essential nutrients including folic acid, iron, and calcium. 7. Stay hydrated- During pregnancy, you may find yourself thirstier than usual. This is because your body fluids are increasing and your baby needs fluids to build cells, deliver nutrients and excrete waste. Aim to drink at least 8 cups of water per day to meet your fluid needs. Dehydration during pregnancy can be dangerous so always make sure you have fluids available to drink through the day. 8. Limit caffeine- Up to 200 mg of caffeine per day are considered to be safe for pregnant women. This is the amount in about 4 cups of caffeinated tea or in two small cups of coffee. Higher amounts of caffeine may be unsafe during pregnancy. I drank a cup of coffee a day (almost always 1/2 caffeinated). 9. Avoid alcohol- All alcohol is considered to be unsafe for pregnant women and should be completely avoided during pregnancy. 10. Eat foods rich in folic acid- Pregnant women have an increased need for folic acid during pregnancy since it helps prevent neural tube defects in babies. Aim for 400-800 micrograms per day. Foods rich in folic acid are: green leafy vegetables, beans, citrus, whole grains and other enriched foods. Your prenatal vitamin will have folic acid in it as well. If your doctor believes that you need more folic acid, you can ask if you should take a folic acid supplement. Nature's Truth has an 800 mcg folic acid supplement available. You can purchase Nature's Truth products online and at CVS and Rite Aid stores.